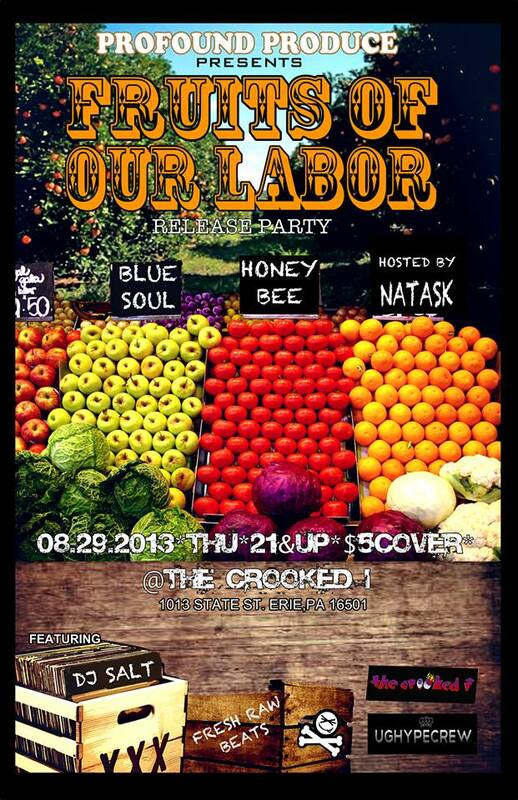 “Fruits of our Labor” PROFOUND PRODUCE CD release!!! Hosted by Natask of the 814 BASS CREW!!!! Dropping that OG Bass, Trap, DUb Hip Hop flavor!! Blue Soul: MUSIC, WORDS, & ART – With Blue Soul, Dan Head brings together a community of artists to showcase their talents in this flowing project of performers, entertainers, musicians, lyricists, poets, and visual artists. For this show, A collaboration of smooth musicians such as Dan Head, LaMorvielle Campbell, andChris Head will be accompanied by some of Eries illest MC’s: Jonny Evans, Tony Facchiano, Profound Produce, Charles Brown. HoneyBee: The prolific singer that has been rocking stages in Erie with us since the jump will be breaking it down. Dj Salt: The mastermind behind Hot Mess Productions be constructing live beats on the spot and off the top. There will be copies of “Fruits of our Labor” and Profound Produce t-shirts on deck. The first 200 people in the door will receive free gift! Underground Hype and The Box truly appreciates everyone who has supported our efforts and this album truly represents what we have become. This entry was posted in 814 BASS CREW, aerosol, art, Art show, Bassline, College Radio, DJ, drum n bass, drumstep, dubstep, EDM, electro, electronic music, erie hiphop, events, Fashion, Festival, fitness, FM, free download, FRUITS OF OUR LABOR, fun, Gannon University, graffiti, hip hop, house, Instagram, LECOM, life, live dubstep, live performance, local, local art, local artist, Moombahcore, Moombahton, music, NatasK, NatasK paintings, Nu Disco, PROFOUND PRODUCE, rap, rave, Run the Trap, Soundcloud, street art, summer, Techy Funk, Trap, Uncategorized, WERG and tagged 814, 814 bass crew, Android Marketplace, art, bass, bass crew, bassblog, basscrew, crooked i, DJ, dubstep, entertainment, Erie, erie PA, Erie special event, Facebook, Fashion, free download, graffiti, Hectic, live podcast Erie, local clothing line, NatasK, Profound, Shopping, sponsor, street art, style, the box 814, The Crooked I, ustream, ustream.tv, ustream.tv dubstep by 8BC Art and Music Culture Collective. Bookmark the permalink.